What is the Photic Zone? 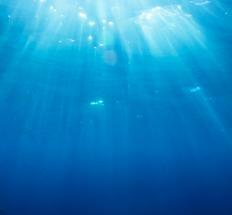 Around 90% of ocean life may be found in the photic zone. The photic zone is the surface layer of a body of water. It has enough light for organisms to photosynthesize. In the ocean, around 90% of the life can be found in this zone. The depth of this zone can vary tremendously, depending on a number of different factors. Depth of the photic zone is measured with a device called a Secchi disc; the disk is dropped in the water and observers make note of the point at which the pattern on the disc cannot be clearly distinguished. Also called the euphotic zone, the photic zone harbors organisms which need light for energy, along with organisms which rely on these organisms for sustenance. This includes plants, bacteria, algae, and many animals. Some inhabitants of this area have developed creative adaptations like pigments which help them utilize sunlight more effectively, so that they can survive in lower light levels. In the ocean, beyond the photic zone lies a phantasmagoria of curious ocean creatures which inhabit the aphotic zone. These creatures have adapted to live in total darkness, and can withstand the extreme cold and pressure found in the depths of the ocean. One area of surprising activity in the deep ocean is around hydrothermal vents, which support thriving communities of organisms which use chemosynthesis for energy. These communities were discovered by accident by researchers who were astounded to find organisms flourishing in such extreme conditions. One thing which can impact the depth of the photic zone is turbidity. Turbidity is determined by disturbances in the water such as silt and mud which may darken the water, reducing the photic zone's depth significantly. Some bodies of water are naturally turbid, while others tend to be more clear. The number of organisms in the water can also make a difference. Huge colonies of microorganisms like algae can literally cloud the are, reducing available light. Researchers are naturally interested in the photic zone since it can provide important information about ocean health. Protection of this zone is important for fisheries and other industries which use the ocean, and for the survival of the environment as a whole. Those microorganisms which inhabit this area, for example, account for a sizeable percentage of the world's carbon dioxide consumption, respiring oxygen as a waste product and keeping the composition of gases in the Earth's atmosphere stable. Phytoplankton are believed to be responsible for as much as 90% of the world's oxygen production. What is the Secchi Disk? What is an Ocean Trench? What is the Difference Between the Continental Shelf and the Deep Ocean? What are Cold Seeps and Hydrothermal Vents? Which Animals Live on the Sea Floor? Where can I Find Ocean Maps? I find the intertidal zone to be the coolest part of the ocean. This is the zone where the earth’s oceans, air, and land interact to create some of the most unique organisms I have seen. I can remember days as a child digging for clams during low tide and catching crabs and sea cucumbers caught in the tide pools. I think my favorite animal was the sea urchin. Someone once told me that they had eyes on the tips of their spines, which I thought was the coolest thing ever. I mean, what kid wouldn't think 360-degree vision was a cool idea. @highlighter- You make an interesting point. I have never really paid attention to coral reefs and why they are so important. I always assumed they were important to people because they sustain a large portion of the Earth's human population, not because it was evolutionary important. What is actually killing these photic zone animals? Why can they only survive in the photic zones of the oceans? I would like to learn more about corals. Of all the animals in the photic zone, I think that corals are the most amazing. They create entire colonies that grow for generations. These same colonies support somewhere around half (I think) of the world's sea life. Without these corals, I doubt that humanity would have made it to where it is today. From what I have read, corals have been supporting marine life for the last 450 million years. This was before the first animal was able to adapt to life on land during the late Devonian Period. In my opinion, it is safe to say that life would have been incredibly different were it not for the presence of corals. that corals are under threat from a number of anthropogenic causes. Coral reefs have been dying in unsustainable numbers for at least the last few decades. Read anything about coral bleaching and one will find out just how important these photic zone organisms are.